Pocket Aces Strategy - Casino Answers! Pocket aces are, no doubt, a good hand, but they suffer from “reverse implied odds”. This is a very important concept to understand. “Implied odds” refers to the money you stand to win if you have a really big hand and your opponent has a decent hand. This is the best hand that you can be dealt pre-flop and you should win this hand close to 80% of the time. The chances of you actually getting pocket aces dealt to you is 1/221 or 0.45% of the time because this is so rare, you need a good strategy when getting this amazing starting hand. This is where “implied odds” and “reverse implied odds” come in to play. Our explanation of hose terms is below. Implied odds are the reason we play suited connectors. When I say pocket aces suffer from “reverse implied odds,” what I mean is that your opponents will probably be playing suited connectors. This means if they do decide to put their money in with you after the flop, they have probably flopped two pair, a straight, or a flush, all of which are hands to which one pair is a significant dog. When you have pocket aces, they are just one pair, and they usually remain one pair all the way to showdown. As you get closer to the river, the chance of your opponent having drawn out on you increases. You see, when you play cards hoping to hit a disguised, monster hand, like a flush, you hope and pray your opponent has a decent hand that he is willing to lose a lot of money with. Aces are exactly what your opponents, who have implied odds, hope you have. This is what it means to have reverse implied odds. The more passively you play aces, the worse your reverse implied odds are. Early in the hand, you should bet and raise at every opportunity, as your hand is highly likely to be the strongest hand. If you feel your opponent can beat one pair, you may have to exercise some pot control by calling down or even folding your pair (though, this is usually too tight). Of course, this is the smartest overall strategy with math behind it but there are times when that is not necessarily in your favor. During a late round, tournament situation you may want to slower play this hand just to ensure that your opponent gets into the pot with you. There is still the same risk as laid out above, but this is the type of risks you’ll have to take in a tournament setting to defeat your opponent. Playing hundreds or even thousands of hands against the same opponent can have a negative effect as you both start to figure out each other’s tendencies and tells. 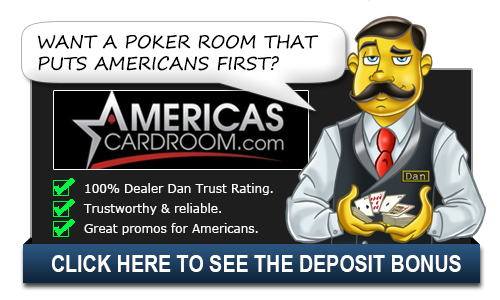 Going outside of the box and playing pocket aces completely different is just one way to counteract that. Have you tried Ultimate Bet? If not, click here for a bonus.